In Raven’s Cry by Dana Fraedrich, Calandra is the youngest child in a noble family, including her Uncle Ducky, who dotes on her. While her brother will one day be a count, she prefers to live on the quiet fringes of court life, avoiding what she considers trivial conversations and longing to spend more time reading and studying. Then, she is befriended by a seemingly kindred spirit in the person of Nicodemus, a magus, a wielder of powerful magic, who proves his worth. He, too, finds the social aspects of court life uncomfortable, and he and Calandra soon become almost inseparable. When Calandra is presented with the possibility of a more permanent relationship with the shy magus, she hesitates. Can she use such a match to the advantage of her people? Is Nicodemus really who he claims to be? Does he have secrets yet to be revealed, and if so, what might they hold for not only Calandra’s future but her land as well? Dana Fraedrich’s Raven’s Cry is an independent story in her finely conceived steampunk fantasy series of Broken Gears. I think the author's whole conception of the world of Broken Gears is fun and imaginative. Simple maps accompany the story, but they fit well with the otherworldly setting of Raven’s Cry. 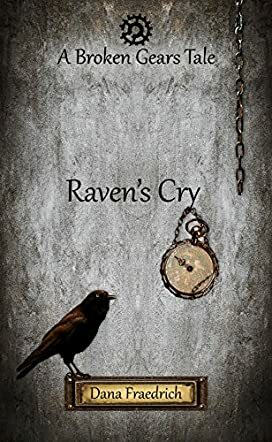 If we readers see a connection between Raven’s Cry and classic fairy tales, it exists. Raven’s Cry is a dark yet purely original recounting of Swan Lake. But, the author expertly blends that tale into the imaginative creation of her Broken Gears world and to good effect. If this is our introduction to Dana Fraedrich’s books, we readers will certainly want to discover and also eagerly read her other stories.